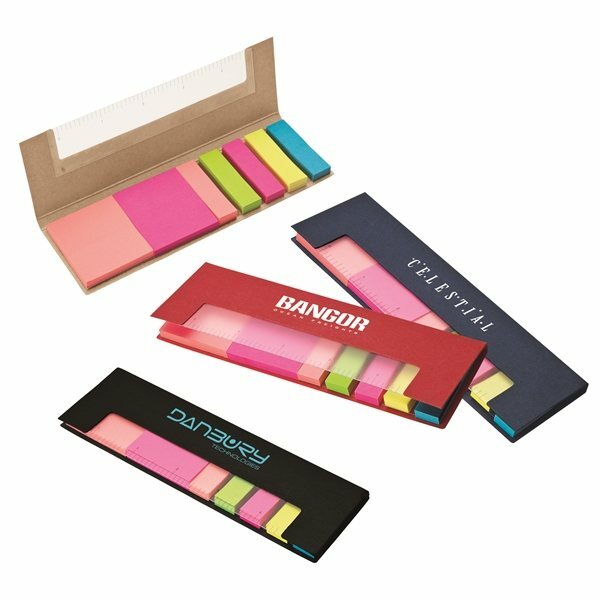 About this Sticky Notes Flags In Pocket Case:Sticky Flags In 5 Neon Colors.Sticky Notes.Tuck In Closure.Compact Case.Special Instructions:Rush Service:Catalog Quantities Only.One Color And One Location. About this Post - it(R) Custom Printed Notes Value Priced Program 3 x 4, 25- sheets:The low cost option -same great Post-it® Brand promise, service and delivery. Printing with process inks keeps it simple and saves money! Available in 25 or 50 sheets per note pad. Imprint your logo and message in 1-4 colors. When using the Post-it® Notes Value Priced Program, requests calling for a specific PMS color will be converted to the closest possible 4-Color Process match. Exact match cannot be guaranteed. No fluorescent, special mix or metallic inks. If color match is critical, we suggest using our Exact Color Match option with true spot color printing. White paper only. Recycled notes available, 10% upcharge. White paper only. Made in U.S.A. Free set-up, Free screens, Free virtual samplesSpecial Instructions:Order must be placed in increments of 250 note pads, up to a maximum of 5000 note pads. About this Sticky Note Flag Notebook:Notebook of 5 pads of colored 3" x 2" sticky notes and a pad of 5 colored sticky flags with hard cover and spiral binding. Finish / Material: Paper/Cardboard.Special Instructions:Rush Service:1. Purchase Order must clearly state artwork instructions and logo to be used.2. One Color/One Location Imprint Only. About this The Accent Recyclable Sticky Flag Booklet:Folding booklet includes sticky flags in 5 bright colors.Recyclable.Non-refillable.Material: Paper.Special Instructions:1 Day Rush, available upon request for 1 color, 1 imprint location orders. About this Deluxe Leatherette Black Sticky Note Organizer With Notepads Sticky Note Flags:Sticky note organizer with four 50-page 1-1/2" x 1" sticky notepads, sticky note flags in 8 colors and two-sided four-year removable calendar.Material: UltraHyde.Special Instructions:1 Day Rush, available upon request for 1 color, 1 imprint location orders. About this Slimline Black Sticky Memo Holder:The Slimline Sticky Memo Pad is checkbook-sized and includes two 1.5" x 2" sticky notepads with 25 pages, 25 sticky note flags in five colors and a 5" x 2.5" white notepad on inside cover with 25 pages.Non-Refillable.Material: UltraHyde.Special Instructions:1 Day Rush, available upon request for 1 color, 1 imprint location orders. About this Lil Sticky Notes Book Memo Pad:Booklet includes sticky flags in 5 colors (25 flags per color) and 3" x 1-3/4" yellow sticky memo pad (70 pages).Non-refillable.Material: Paper.Special Instructions:1 Day Rush, available upon request for 1 color, 1 imprint location orders. About this Bic 3 X 3 X 1.5 Adhesive Sticky Note Cube Pad:Print your logo with a brilliant 4-Color Process on these Bic Adhesive Cubes 3" x 3" x 1 1/2" to make sure your brand is represented in its best light! These topic starters make great gifts for your employees and your customers! Bic 3" X 3" Adhesive Cubes with 60# offset paper. 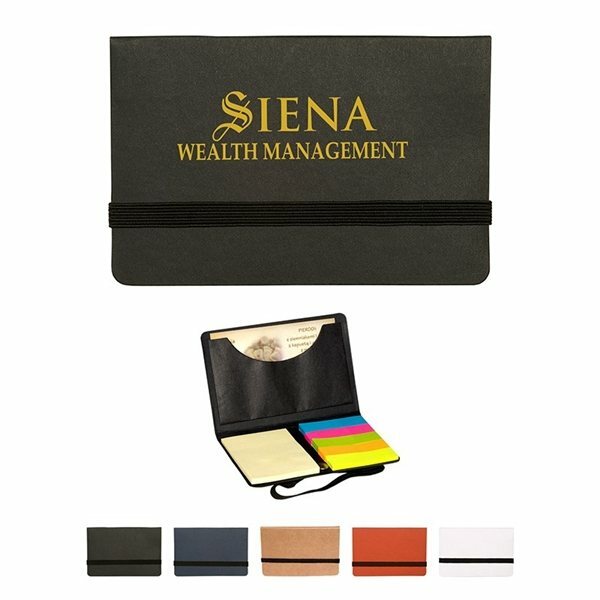 About this Memo Holder: Enclosed within leather-like case you'll find 8 assorted colored sticky tabs (each containing 150 notes), 2 sticky note pads (1 small and 1 large, each containing 150 notes) and a 4 year calendar. Imprint your company name and logo (gold or silver only) on the case and handout at tradeshows, college bookstores, banks, accounting firms, law offices and more! Packed in a silver gift box. NOTE: Product comes with Prop 65 warning label when shipped to California. Label reads: "WARNING: This product may contain carcinogen, which is known to the State of California to cause cancer. For more information, go to www.P65Warnings.ca.gov. About this Rita Pen, Note Flag Set:This natural note book is includes a note pad, 3" x 3" sticky note pad, 5 colored flags, and a ballpoint pen. Finish / Material: Paper/Cardboard, Plastic.Plunge-Action Ballpoint Pen with Matching Paper Barrel.120 Page 5 1/2" x 3" Note Pad.Special Instructions:Rush Service:1. Purchase Order must clearly state artwork instructions and logo to be used.2. One Color/One Location Imprint Only. About this Calculator Sticky Note Case:Hard cover memo case includes calculator, 8 assorted color sticky arrows, 3 1-1/2" x 2" sticky note pads.Calculator features on/off power buttons.Includes solar power battery backup.Material: ABS Plastic.Special Instructions:1 Day Rush, available upon request for 1 color, 1 imprint location orders. Thank you Alicia, Aliesha and Jennifer! We’re glad to read your positive reviews on our top adhesive notepad. Our BIC 4” X 3” Adhesive Notepads are great to give for any company. Your company logo will be placed right in front of each sticky to remind your customer about your company! This is a great marketing tool to allow your customers to remember your company. The Custom BIC 4 x 3 Notepad features notes that have adhesive backing. These are essential to any office. The Custom BIC 4 x 3 Notepad offers a large imprint space of 3 5/8" W X 2 5/8" H.
The Custom BIC 4 x 3 Notepad offers a variety of pad colors and imprint colors for easy branding. Thank you Ari, Ira and Chase! Our Business Card Sticky Pack is one of our top sellers! The extra stickies that are included in the business card holder is what makes it so special. Thank you Bryson and Ariana! We’re happy our customer service team is constantly being recognized for their service. The Note, Flag, and Ruler Set is great to give at any event! Customers will love to use the stickies included. 2 Colors of 50 Sticky Notes. 5 Colors of 50 Sticky Flags. With nearly 300 promotional notepads & cubes, you’ll definitely be able to find the perfect promotional notepad or cube you can stick to! We have sticky notebooks, memo pads, adhesive notepads, stick book with ruler, measure pad leveler with notepad, flag sets, and more! You’re bound to find the notepad or cube that fits with your company. Note pads and cubes are great to keep write notes and reminders. You can place them all over your office desk or refrigerator. Sticky note pads help remind you of everything you need to get done! Don’t pass by this promotional item that most customers use on a daily basis. Use notepads and cubes to promote your company. Give these out to your clients to remember your company! Look through our selection of notepads & cubes. Shop here! Here is a snapshot of our selection of 292 custom notepad and cube choices. We’re ready to help expedite your order, so give us a call! 40 Sheet Mouse Paper, 7 1/4" x 8 1/2"
Grab your promo cube swag today! At AnyPromo, we place a high standard on brand impact, just like our customers. Search our site for a wide selection of promotional notepads and cubes so you can see for yourself. Trade show and event guests are bombarded with boring branded swag at every opportunity, so it is extremely important to stand out. Our custom cubes and notepads are specially priced and proven to generate impressions. Click through our inventory of promotional notepads on sale now. 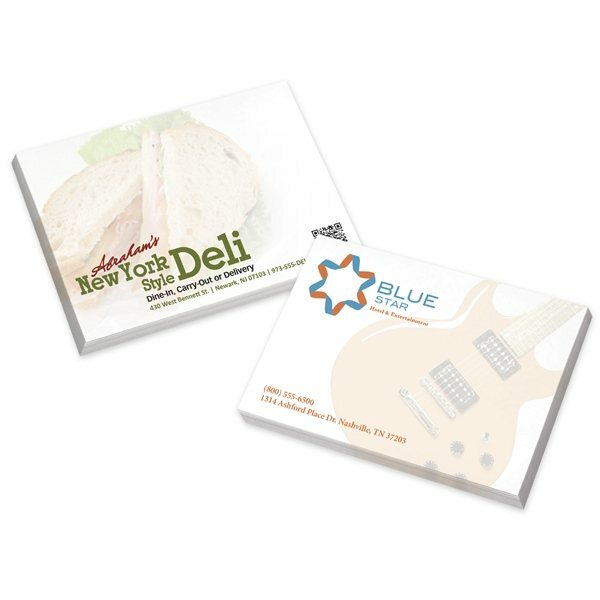 Notepads and cubes are a great giveaway for offices, educational institutions, private businesses, and more! You can give these notepads out for customers to write notes and reminders. Exhibiting at a trade show? Notepads and cubes will definitely help potential customers write important notes as they walk the trade show. Don’t miss out on this awesome marketing tool. Our featured list of notepads and cubes are filled with top sellers! You won’t want to miss out on any of our products below. Measure Pad Leveler – 6 Ft.